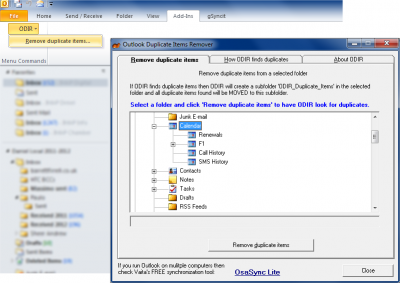 There is a free application called Outlook Duplicate Items Remover which is an excellent quick, free, and safe way to remove duplicate entries from Outlook. It’s useful if you’ve got a folder with some (or lots) of duplicate entries – perhaps duplicate calendar events, duplicate contacts, or multiple copies of email messages. It’s free to download from the Vaita website. Once installed, it is accessible from the Addins tab of the Outlook ribbon toolbar.